AS was required, Sheffield Steelers took care of business at their end over the weekend, picking up a maximum four points as they strive to chase down the Elite League’s top two. For their part, unfortunately, leaders Cardiff Devils and second-placed Belfast Giants also did what they needed to, meaning the only thing to have significantly changed is that Paul Thompson’s team have two fewer games in which to overhaul their rivals. 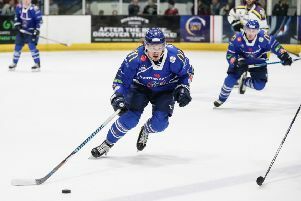 Encouragingly for the Steelers, though, was their ability to find the back of the net on a regular basis over the two nights, edging out Dundee Stars 5-4 at home on Saturday before walloping hosts Coventry Blaze 8-2 less than 24 hours later. Colton Fretter led the way in the West Midlands, his four goals being backed up by a pair apiece for Mathieu Roy and Robert Dowd. Fretter and Dowd got on the board in the first period, while second period honours were shared when Dowd’s second of the night at 34.43 provided a riposte to Robin Bergman’s 25th-minute power play strike. Fretter grabbed his second at 43.25 to make it 4-1, but it was in the final 10 minutes that the game really came to life. Marc Cantin made it 4-2 at 50.26 before a fight between Garrett Klotz and Steelers’ Guillaume Desbiens saw both players’ nights come to a premature end. Once matters had settled, the Steelers proved unstoppable, Roy pouncing at 51.34 before two more from Fretter within the space of four minutes put the game beyond doubt. Roy added a last-minute strike to add insult to injury for the home side. Against Dundee, it was Roy who put the Steelers ahead after just 38-seconds, before Dowd doubled the advantage in the ninth minute. It was the Stars who struck next, however, when Kevin Bruijsten scored on the power play just 28 seconds into the second period. Cale Tanaka then missed a penalty shot, before Vinny Scarsella’s 24th-minute strike deservedly drew the visitors level. The home fans were then left fearing the worst when Bruijsten’s second of the night at 26.17 put Dundee ahead, but a frenetic second period was far from done, the Steelers quickly levelling through Levi Nelson before Roy grabbed his second at 32.25. The teams went in level ahead of the third, however, following Joey de Concilys’s short-handed effort in the 34th-minute. In a one-sided third period during which the hosts outshot their opponents 16-to-1, the winning goal still took a while to find, Nelson’s 53rd-minute power play strike eventually proving just enough.